Combine ginger, garlic, star anise, soy sauce, honey, sriracha sauce, lime juice and water in medium jug. Whisk until well combined. Pour mixture over pork. Cover and cook for 3 hours on high, turning pork every 30 minutes, or until tender. Remove pork from slow-cooker to a plate. Cover to keep warm. Pour sauce from the slow- cooker into a medium saucepan. Bring to boil over high heat then reduce heat and simmer until reduced by a half and slightly sticky. Remove string from pork. 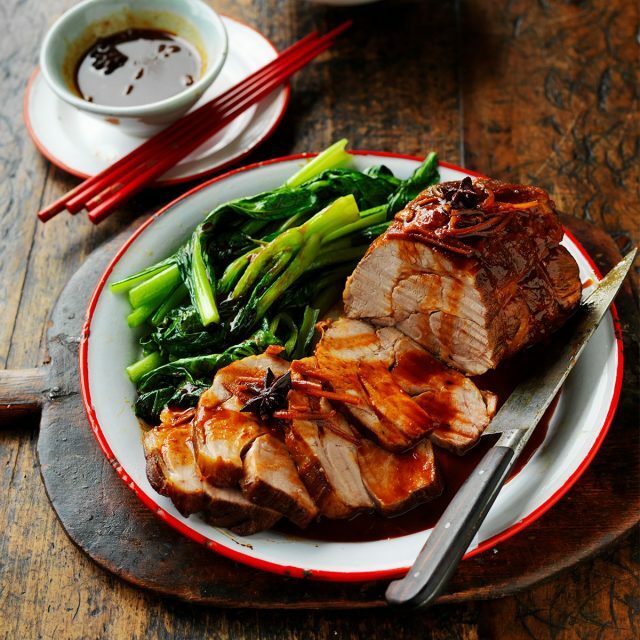 Slice pork and serve with the sauce, coriander leaves, rice, choy sum, coriander and lime wedges.